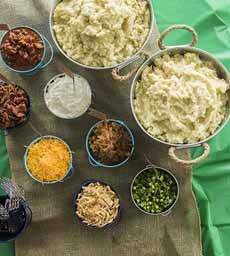  Who can resist a mashed potato bar (photo courtesy Betty Crocker)? 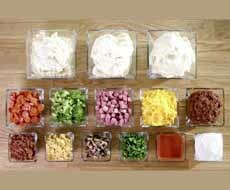 Use whatever dishes you have for the toppings. They don’t have to match (photo courtesy Hormel Foods). If your guests can cope with glass, use your Margarita and Martini glasses (photo courtesy Hormel Foods). 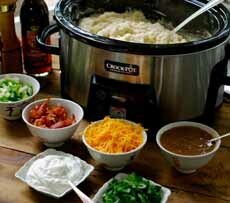 Keep the potatoes warm in a slow cooker (photo courtesy Tip Hero). 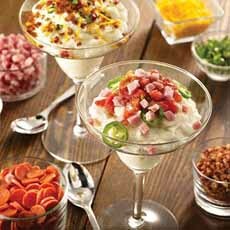 Whether you like to grill for Father’s Day or prepare everything in the kitchen, a fun, interactive addition to the festivities is a mashed potato bar. Our dad loved our cold green bean salad. With a bowl of that, and a cucumber salad or a special slaw, the only other side you need is the mashed potato bar. It’s a treat for guests to customize their toppings. For you, everything can be prepared ahead of time, including the potatoes, which are kept warm in a slow cooker or other device. Don’t want potatoes? Substitute mashed cauliflower. Make the mashed potatoes with or without skin, using your choice of red, white or golden potatoes. If you like to load up the groaning board, offer mashed sweet potatoes as well. If you don’t have a slow cooker to keep the potatoes warm, use aluminum foil pans with steam warmers underneath. For a fancier event, use chafing dishes. If you don’t have any of these, see what you can borrow. Steamed medley: broccoli, carrots, zucchini, etc. *Assumes beef and chicken are main courses from the grill.